This is one of the best things TRAI has done. I was forced to subscribe to 500+ channels, most of which I had no interest in. Sure, the bill will go up now if I want to watch several channels. But, logically and reasonably, those who watch just a few channels pay less. No more cross subsidization. The network capacity fee (NCF) and channel prices announced by broadcasters and distributors as per the Telecom Regulatory Authority of India's (TRAI's) new guidelines could increase the monthly bill of most subscribers of television channels, says a research report. In the report CRISIL says the new regime, which came into effect on 1 February 2019, will benefit popular channels and hasten adoption of over-the-top (OTT or content providers who stream media over the Internet, such as Netflix and Hotstar) platforms, and will be a mixed bag for viewers and distributors. "Our analysis of the impact of the regulations indicates a varied impact on monthly TV bills. Based on current pricing, the monthly TV bill can go up by 25% from Rs230-Rs240 to about Rs300 per month for viewers who opt for the top-10 channels, but will come down for those who opt up to top five channels," says Sachin Gupta, senior director, ratings at CRISIL. CRISIL's analysis assumes a scenario where subscribers opt for the top-10 channels by viewership in addition to the free-to-air (FTA) ones. TRAI's new regulatory framework for broadcasting and cable services industry is intended to usher in transparency and uniformity, and will afford far greater freedom of choice to viewers. More than 90% of TV viewers flip 50 or fewer channels, and the new rules will let them subscribe to what they want and not be saddled with channels they are not interested in. However, CRISIL feels that the new regime could drive consolidation in the broadcasting industry because content will clearly be the king and key differentiator. It says, "Subscription revenues of broadcasters would rise about 40% to Rs94 per subscriber per month compared with Rs60-Rs70 now. With viewers likely to opt for popular channels, large broadcasters will have greater pricing power. Conversely, broadcasters with less-popular channels will find it tough to piggyback on packages, and the least popular ones will hardly have a business case and could go off air." For distributors (DTH and cable operators), the ratings agency feels the new regulations are a mixed bag. "While content cost will become a pass-through, protecting them from fluctuations, they may lose out on the benefits of value-added services such as bundling content across broadcasters, customisation, and placement revenue," it adds. Currently, most distributors are charging NCF at the cap rate of Rs130 per month. 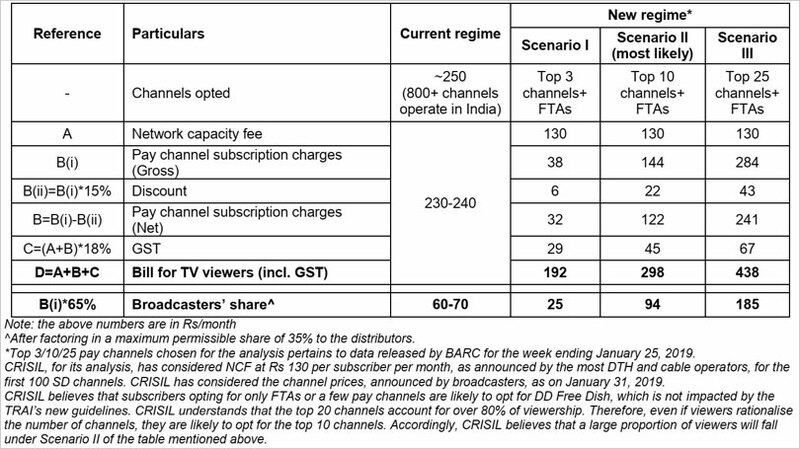 Similarly, broadcasters have priced subscription for the most popular pay channels at the cap rate of Rs19 per month. It was a prophetic article. Congratulations. We are customers of DEN. The cost of viewing TV has indeed gone up almost double. On top of it, the TRAI authorities just do not care even to respond to the complaints mailed to the designated officer and the service provider clearly does not care about TRAI either. This is my sad experience. Prices are going up of such essential services while financial & economic market s world over are imploding. Common man shall bear the brunt. Besides increasing the overall bill for DTH, citing this new regime, the DTH providers have made it so cumbersome to switch to the new system of a la carte and pushing new bundle packs instead. I am planning to sell off my DTH and just watch the ones needed by streaming. Though new Trai regulations was meant to stop exploitation of the subscribers by offering boquets, even now the DTH poviders and Broadcasters are offering boquets. After chosing the boquets one has to go thru the laborious route of chosing channels not included in the boquet (including FTA channels). On the whole, one wishes that TRAI's regulations have created havoc to the consumer. DTH providers have , as expected, succeeded in gaming the new Trai regulations. They have made the very process of selecting channels very complex. After several frustrating attempts I have now settled for some channels and packages --end result is that I am paying more for less now! Most modernisation and rationalisation methods adopted have led to increased expenses for the layman. These are made compulsory and so he has no option. To give you another example ... dematerialisation of shares. When shares were held in a physical form and one did not buy or sell shares, there were no depository charges. Now even if I have no transactions, I have to pay depository charges every month. Very tine article.i agree to it.